Classical music is often thought of as an elite art, usually performed in concert halls to a dedicated, dressed up audience. But two young pianists are working hard to make this style of music more accessible to wider audiences. As Faiza Elmasry tells us, to do that, they're offering free performances on a mobile stage, The Concert Truck. Trucks can be used for so much more than transporting goods from one place to another. They can be transformed into restaurants, mobile health clinics ... even a concert hall. That's what two young pianists have done with their truck as they work to make classical music more accessible to a wider range of audiences. Though people can listen to music anywhere, on radio, TV or on their earphones with MP3 players, Luby says nothing is like listening to live music. “When you listen to live music there is energy they just can't get from recordings.” He adds, “It brings people together. For me it makes life worth living." The Concert Truck is classical performance on wheels. But for Zhang, the idea of using a truck to bring live music to different locations was a bit unsettling at first. The next step was to get funding. That was two years ago, and they've been performing ever since. Zhang admits that performing from a truck, in the middle of street traffic and noise, can be challenging. It only takes a few minutes for Luby and Zhang to turn their truck into their stage in the middle of the street. And the artists don't take it personally when people pass by and don't stay to listen. "When people walk by and listen for a second and keep going you definitely notice, but the fact that someone stops even for a second or a minute is really a nice thing to be able to share that moment with people," Luby says. On a recent day, the performance is in front of a farmers market in Baltimore, where Luby and Zhang are both high school music teachers. With their rented piano tightly stored aboard the truck, the duo head downtown. The 5-meter-long Concert Truck is equipped with speakers and lights, and takes only a few minutes to transform into a stage. The music draws a lunchtime crowd, including Reba Cornman, who was buying some herbs from the farmers market. "All of a sudden, I heard (Sergei) Prokofiev’s 'Cinderella' played on piano," Cornman says. “I love Prokofiev! I came right over and sit down. It was extraordinary. I know they're trying to reach all kinds of audiences and being on a truck is such a remarkable way to do that." Baltimore Farmers Market manager Jill Ciotta worked with Luby and Zhang to bring their Concert Truck to the market. She considers the performing experience part of the healthy focus the market, which is run by the University of Maryland's Medical Center, tries to promote in downtown. “We’re always open on bringing in things that make it better and bigger and really draw people outside, get moving, walking, and get healthy food. I’d love to see more performances here, I’d love to see them attracting more people, employees, students and neighbors, and getting them to enjoy the outdoors," Ciotta said. 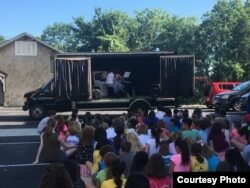 The Concert Truck has performed in schools, children’s homes and homeless shelters, in addition to public squares in several cities in South Carolina, Ohio, Maryland and Minnesota. These trips, Luby says, bring him closer to his dream, "to create a platform that allows musicians, not just us but many musicians, to share their craft and their art broadly." That dream is what keeps Luby and Zhang energized, and on the road, bringing the Concert Truck and classical music to new audiences.